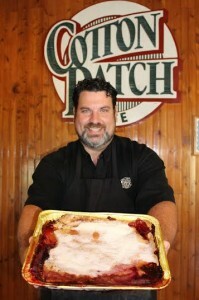 LUFKIN, Texas– Cotton Patch Café is looking for Cobbler Gobbler’s with the messiest face and biggest smile as they celebrate 25 years of pride in East Texas. This year, at the 30th annual Texas State Forest Festival presented by Brookshire Brothers, festival-goers will have the chance to show off their cobbler eating skills. The 1st Cobbler Gobbler Eating Contest sponsored by Cotton Patch Café will be a contest you won’t want to miss. Clothing will get messy in a matter of seconds as contestants will not be allowed to use their hands. Contestants will have 10 minutes to gobble cobbler. All cobblers will be weighed before the contest and will be weighed again at the end of the 10 minute time limit. Preliminary Events: Wednesday, September 17th at 6:30 p.m.
Finals: Saturday, September 20th at 12:30 p.m.
All cobbler eating contests will take place at the George H. Henderson, Jr. Expo Center in the Children’s Festival pavilion. To register, please complete a Cobbler Gobbler Eating Contest waiver at Cotton Patch Café located at 1615 South First in Lufkin, Texas. Waivers must be signed by contestants prior to the contest. Children under 18 must have a parent or guardian present with a signed permission entry form. We hope to see you with the messiest face and biggest smile at the 30th annual Texas State Forest Festival. 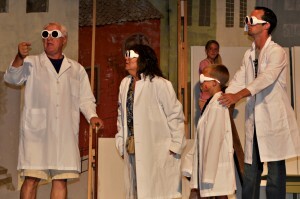 Palestine – Palestine Community Theatre (PCT) is gearing up to bring audiences a sticky-sweet confection of “Pure Imagination!” Roald Dahl’s timeless story of the world-famous candy man and his quest to find an heir will soon come to life at the Historic Texas Theatre in the musical adaptation, with classic songs from the Oscar-nominated family film. 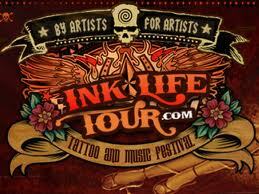 Longview – The Ink Life Tattoo and Music Festival is the worlds largest and most talked about tattoo and music festival! This three day mega event hosted by the world famous House Of Pain Tattoo Studio in El Paso, TX and MC’d by Dr. Blasphemy captures the true essence of the body art lifestyle. August 24 through 26, artists will flock to the Maude Cobb Center in Longview to take part in this event. ATHENS—David L. Campbell, coordinator of Texas Parks and Wildlife Department’s ShareLunker program, will retire at the end of March. Campbell has worked for Texas Parks and Wildlife Department for 46 years. He was inducted into the Texas Freshwater Fishing Hall of Fame in 2011.